It was the drawer of eyeballs in his optician father's office that mesmerized 6-year-old Gordon Kolberg in 1945. "There was nothing like bringing my friends over and opening that drawer, "Kolberg said. " I knew then that I was going into Dad's business." Once he became an optician, Kolberg's fascination with artificial eyes increased. He painted the special touches that make artificial eyes look realistic and joined the American Society of Ocularists, ASO -- makers of custom artificial eyes. 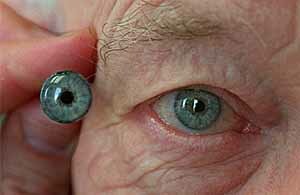 Approximately 12,500 people a year in the United States lose the use of an eye, according to the American Academy of Ophthalmologists. Seventy percent of eye loss occurs because of disease; 15 percent because of accidents, such as BB gun mishaps; and another 15 percent can be attributed to complications tied to various types of surgery, Kolberg said. Kolberg's detailed work and development of related ocular devices has brought him worldwide recognition over the years. But it also continued a family legacy. Kolberg Ocular Products Inc. is now a third-generation venture. Kolberg's children, Erik and Kirstin, are board-certified ocularists, just like their father. Having gone through ASO apprenticeship training, they join the fewer than 250 ocularists around the world who belong to that organization, which is based in the United States. "I knew early on I'd end up here," said Erik, 31, who lives in San Marcos. "My dad made me a gearshift handle for my car that was an oversized eyeball, and a key chain with an eyeball hanging on it. "My friends loved him to come to the classroom with eyes in various stages of development to explain what he did for a living. Some of them were intrigued, some were grossed out. I just wanted to be like my dad." Today, Erik has picked up where his dad and grandpa left off. He hand-paints artificial eyes until they are nearly flawless, and "laymen" often cannot tell which eye is real, and which is his work. Kirstin, 34, started as a medical secretary for her father. "I saw these patients leaving the office, hugging and kissing my dad, crying and the joy was incredible," she said. "I wanted to be a part of that." She plans to open her own office in Northwest Arkansas in 1999. Kolberg senior now devotes most of his attention to developing medical devices and gadgets that will make artificial eyes even more realistic. "I love the fact that my kids are so skilled at this," Kolberg said. "We can make an artificial eye look extremely real today. Erik has far surpassed my talent, and he is the best in color-matching (making artificial eyes look like real ones) I've seen."